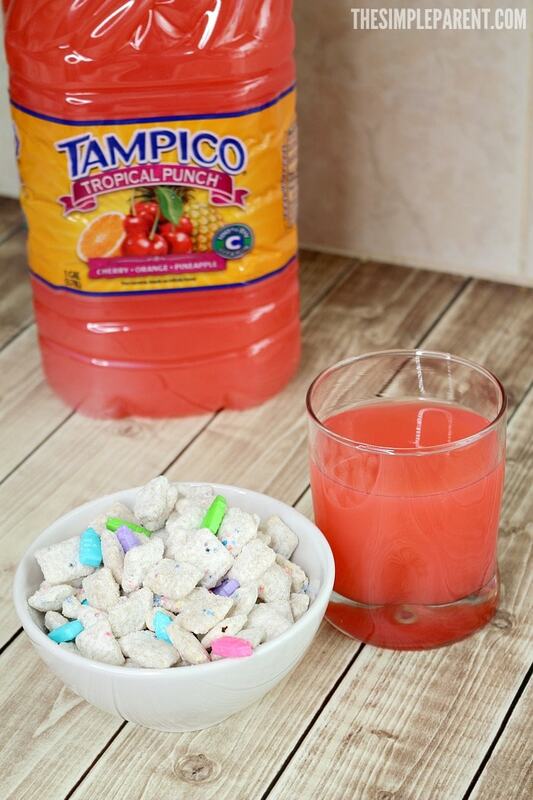 Our Rainbow Puppy Chow recipe is part of a sponsored partnership with Tampico Beverages. When it comes to having fun together, we’re a family movie night type of family. 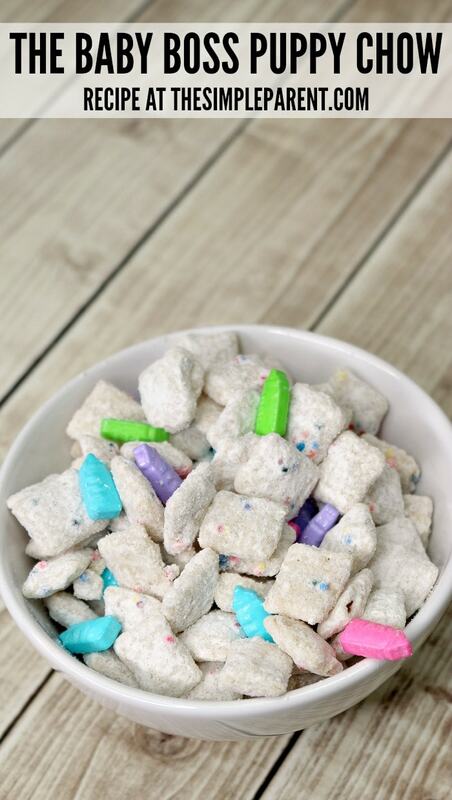 All we need is a good movie, our favorite drinks, and some tasty snacks like this rainbow puppy chow recipe. Puppy chow is one of our favorite treats to make because an easy puppy chow recipe usually takes less than 15 minutes to make! Plus it’s super easy to tweak the recipes to make your movie night snack themed to go with your movie! We’re a movie going family. We love to see kid-friendly movies together in the theater then again when they come out on DVD. It’s just one of our family traditions and I think it’s going to lead to so many great memories when the kids are older. 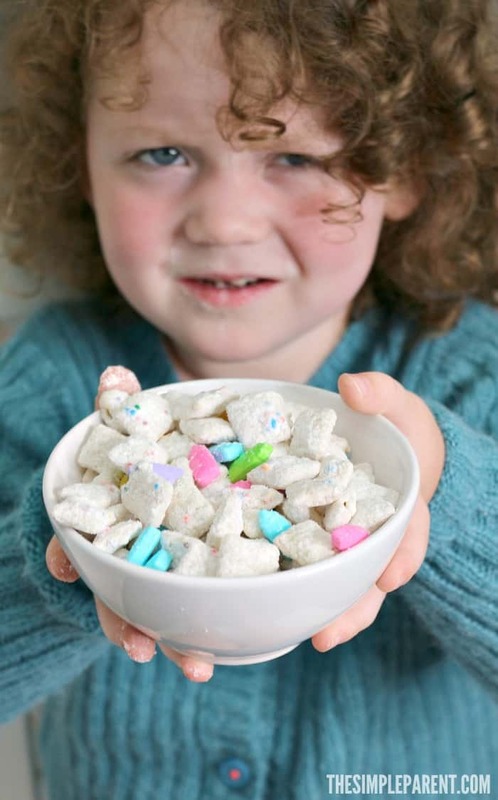 Lately Carrigan has been talking all about seeing the baby movie (aka DreamWorks The Boss Baby), and since I’ve been wanting to make sprinkles puppy chow again, it seemed like the perfect way to have a little movie themed fun. In case you didn’t know, Tampico has a partnership for the upcoming movie, DreamWorks The Boss Baby, that is inspired by the fun and heart-warming message of the film. They’re launching their “Raise a Boss” scholarship sweepstakes to go along with it! You can learn more at the bottom of this post. Check out how this partnership inspired us to get even more excited for the new movie! 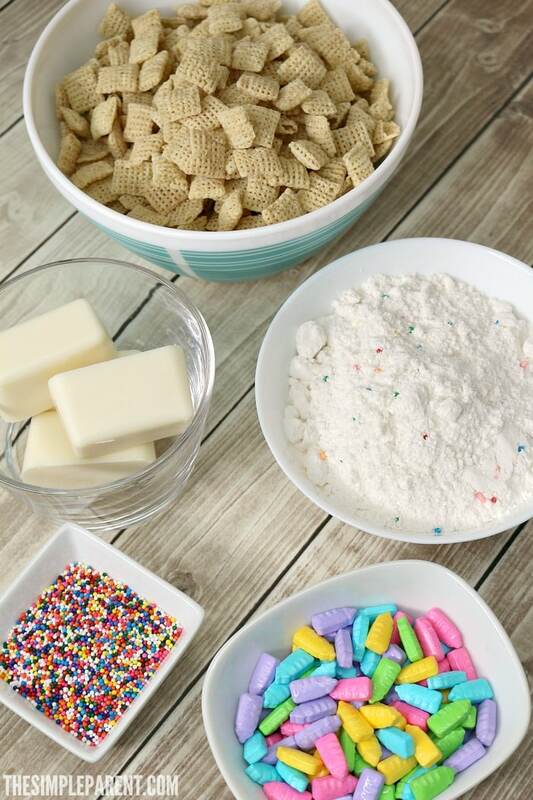 With help from Tampico, we came up with an easy and fun cake puppy chow recipe for when we have our DreamWorks The Boss Baby family movie night (because it’s definitely going to be one the kids insist on)! It pairs great with fresh popped popcorn and our favorite Tampico flavor! Place the vanilla almond bark in a microwave safe bowl and microwave on high for one minute. Stir then heat for an addition 30 seconds and stir again. Repeat until melted. Place rice cereal in large bowl and pour melted almond bark over it. Stir gently until cereal is well-coated. Add sprinkles and stir gently. Place cake mix in a large plastic zipper bag. Add cereal mixture and shake gently to coat with cake mix. 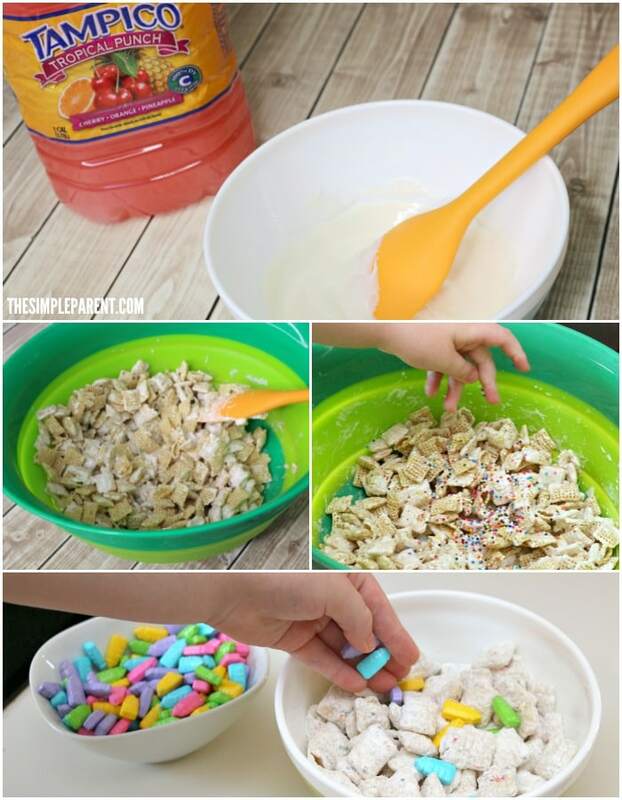 Sprinkle with baby bottle shaped candies to make it Dreamworks The Boss Baby themed! 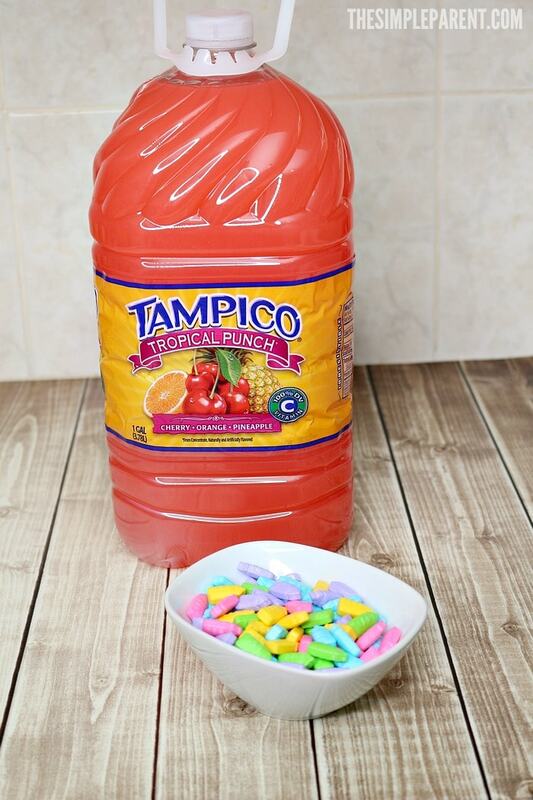 Whip up a batch of our cake mix puppy chow recipe, pop some popcorn, and pair them with your favorite Tampico flavor! You’ll have an easy and family approved sweet and salty treat to enjoy together! 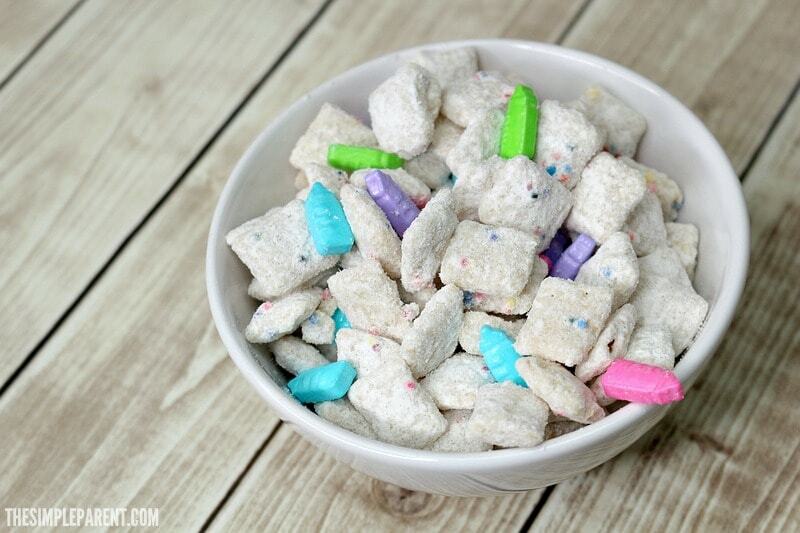 Rainbow puppy chow is one of our favorite versions to make. You can tweak the flavor by using different flavors of cake mix. Or you can make yours fit any theme you want my changing up the sprinkles and the candy you add in! The important part of seeing movies like DreamWorks THE BOSS BABY and having family movie nights are spending quality time together. Quality time means memories made that our kids will carry with them their entire life! 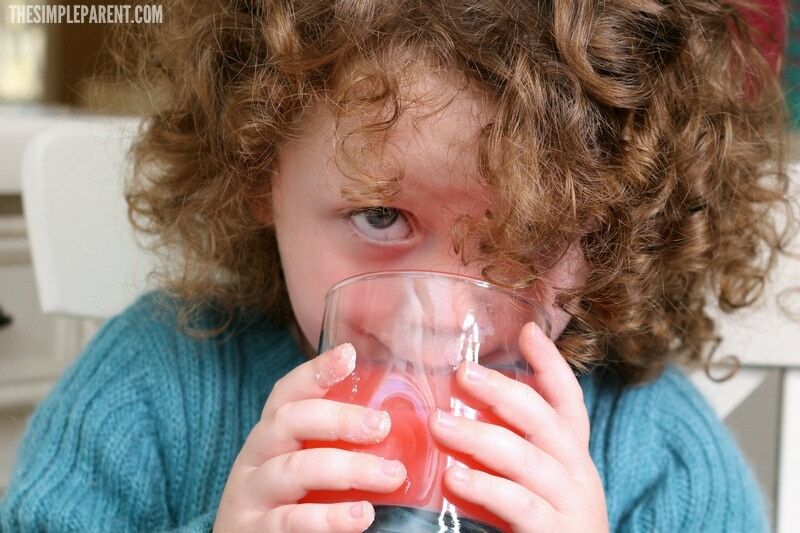 For more fun ideas of ways to use Tampico in recipes, recipes to pair your favorite flavor with, and fun family activities, be sure to visit TampicoIsColor.com! And check out DreamWorks The Boss Baby in theaters everywhere on March 31, 2017! Click the photo below to PIN it for later!